Click on a link to hear the names beginning with those letters. A sumptuously illustrated treasury of Greek myths filled with lively retellings of stories of brave heroes, powerful gods and terrible monsters, presented in a luxury, cloth-covered hardback. With thirty-two popular and exciting stories including “Pandora’s Box”, “The minotaur and the Labyrinth”, “Jason and the Golden Fleece”. Illustrated notes in the margins offer further insights into the history of Greek myths. Includes an extensive reference section with illustrated maps of Ancient Greece, a glossary of tricky words, a huge Who’s Who of heroes, monsters, Gods and locations and an online pronunciation guide to Greek names. A very accessible, well-written and extravagantly illustrated bargain of a hardback. Lots of information, including maps. One to keep forever. There is nothing like inquisitive children for exposing gaping holes in one’s general knowledge. 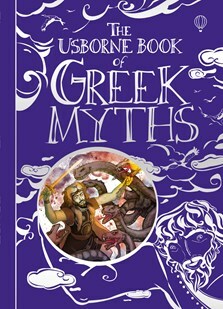 The recently published Usborne Book of Greek Myths has enough wars and monsters to keep my boys rapt while I make notes on the gods and goddesses. A good present for an eight-year-old. My 7 year old son loves this book. It is the first thing he looks at on waking. We have to hide it from him to ensure he gets dressed and off to school on time. When he comes home, it's the book he reads before doing anything else. He can read it himself but he loves being read to from it at night. I picked up this book because the attractive cover intrigued me. Sure enough, this book is something special. With exciting stories, illustrated with beautiful pictures and easy-to-understand text, it takes you back through the ages to the scenes of the stories. Including the well-known myths like 'Pandora's Box', 'Jason and the Golden Fleece',and others, new stories are also added. I thoroughly enjoyed reading this and I think that others will too.